Which Ones Have You Heard? They are not. However insects of various kinds are important in orchid reproduction. Many orchids pollinate by luring insects to them and then the insects transport the pollen to another orchid. Many orchids have a complex relationship with insects in the wild but they do not in fact eat the insects. #2 Orchids come from the Tropics. Some orchid flowers do come from the tropical climates but they grow in any climate and in any country, even Alaska. Not anymore. There has been an increased interest in orchid gardening and in the number of orchid growers. Now there are modern reproductive methods for orchids and so orchids are now more reasonably priced. Some orchid flowers last as long as 3 months. That makes them even less expensive then a nice bouquet! And they last longer and you have a plant (an new orchid friend) that can bloom again and again. #4 Orchids are Hard to Grow. This orchid myth is far from the truth. They are not anymore difficult than any other plant. They need the basics, water, light, air and fertilizer. Once you know what they need and meet those needs your orchid will thrive. The plant can last for many years and flower repeatedly. Want to Learn All About Orchids? Then Check Out this Page. #1 Are all orchids the same? #2 What soil do they grow in? #3 Do orchids only last a short time? On the contrary, most species can last for years if they receive proper care. There are some plants which were propagated in the 18th century and continue to live today. Orchids can take years to come to maturity and bloom. Typically, the plants are anywhere from 5 to 8 years old. #6 Is conservation of orchids important? According to the American Orchid Society conservation is a priority. Threats to orchids come primarily from loss of habitat and collecting. 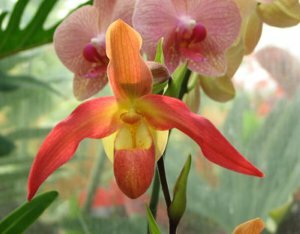 The AOS encourages the purchase of only artificially propagated orchids. #7 Should orchids be protected from a draft? This could be another orchid myth but the answer is no, orchids prefer moving air and good circulation but should not be over a heating or air conditioning vent.